ChainLink Research : Research :SaaS Pricing: Part One - Insanity or Good Deal for Users? SaaS Pricing: Part One - Insanity or Good Deal for Users? This two-part series discusses the current pricing models for SaaS vs. On Premise. The last two years have brought an explosion of Software as a Service (SaaS) solutions. Both new app players and traditional enterprise software license providers have provided new versions of their software and services to ensure a market presence in the cloud delivery model. Along with this change we have witnessed new models in pricing strategies. 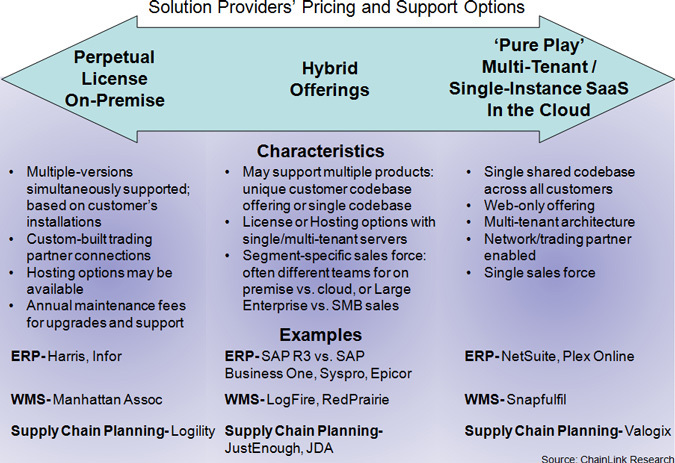 The problem is that it is very hard to compare pricing—not just between the competitors—but also for same-company cloud vs. on-premise options. So, as the customer, how do I know I am getting a good deal? To answer this question we will review the approaches now on the market and demystify the pricing methods and what they mean, so users can evaluate their options. Sadly, there will be no apples-to-apples comparisons here, since many companies price differently. For example, one company may price by seat (per named or concurrent user), another by module, another by connections (to trading partner or to system), or another by data storage used. This means that users have to better understand their own requirements across a broader spectrum—not just software and seats, but how their usage will grow over time. Technology architecture, the way it is delivered, and to whom it is delivered affects the cost of a solution. There are costs such as software, integration, hardware, services and support. And, there are generally your own additional internal costs such as staffing for the project, as well as data center space, the energy costs of managing the data center, and IT staff training for ongoing system management once the system is installed. There are many other costs associated with selection, purchase, implementation and ongoing technology management. We’ll look at a few issues to create a foundation for decision-making. Enterprise vs. Community – When considering cloud solutions today, the first consideration is just “who is the customer?” Is the goal to ‘host’ and serve one enterprise or to create and integrate a whole community beyond the enterprise? These are very unique requirements requiring different technology and on-going management. It is also the first issue to understand, since these choices lead to very divergent requirements and costs structures. Enterprise – Purchasing an application for just your company. Examples for enterprise would be ERP or Warehouse Management 1 applications. In many ways, enterprise software, whether SaaS or On Premise is evaluated and priced in much the same way: by software package, module, seats, number of servers (server size) or per site. The pricing approach varies little by vendor. Community integration – the ability to operate across enterprises by process. Included would be the software functions as well as the connections and transactions, typically between trading partners. Examples are Finance and Banking, Trade and Supply Chain, Procurement, Transportation Management, Collaboration, Product Design Applications. Most pure communication and transaction technologies, such as EDI and Managed File Transfer, are also examples of community integration. Here, the evaluation needs to include both the software and the community integration (existing protocols and connections) that enable trading partner integration. These costs are added to the price of the software. They can be priced by trading partner connections, protocols or processes, or even by transaction. Often in these environments, the community provider will charge for the connections or transactions, but not for the software module. A further distinction is between private and public communities. Some solutions have a single public network of trading partners that all participants connect to. Others allow each customer to set up their own private network with their trading partners. This can impact on-boarding 2 and customization costs. Spend Under Management – Transportation and Procurement solutions are often priced by ‘spend under management,’ i.e., your budget for annual transportation costs, or by the total amount of supplier purchasing you do. Often it is very hard to understand what a transaction really is: There are so many changes to orders and so many customer ‘look-ups’ to access information, that defining the transaction might be quite difficult. So this approach, total spend, looks at the value of the activities and transactions being done, instead of the number of transactions. Firms like CombineNet do this. If you spend $100 million per year on your transportation costs, they derive a typical profile of how much activity, i.e. spend, is going on and determine a price. User Connectivity – Will users be remote, multi-site, and mobile? How will they access the solution? What devices will they need to access? Here we look to some opportunity for discounting if a solution provider can bulk purchase and integrate mobile devices, network hardware, and network services for the customer, as well as integrate support into the whole installation cost. Recently, we have seen solution providers like LogFire and Snapfulfil purchase and manage all the hardware and networking services associated with the project. Of course, these costs are charged to the customer over the payment period, but it removes these infrastructure management and maintenance concerns from the customer. Again, a trade-off. Security Requirements – In addition to the built-in security of the software application, there may be additional costs, such as directory management, key management (e.g. PKI), and single sign-on. Again, there are costs, and then who will pay becomes the question. Obviously, the user ultimately pays, but cloud providers may be able to stretch the costs across their customer base. On Premise requires you to purchase and manage security software, remote login security, layers credentialing, and single sign-on for employees. Hardware and Data Center Management – Often users are myopic about these charges, and especially today, they are often considered trivial. However, proper management (back up, security), network and service performance, and the ability to scale as the organization grows are all part of the costs. Especially where high availability is required, the costs of redundant, geographically separate systems and data centers can be considerable. For larger operations, in addition to the allocation of a secure location and the costs associated with managing the space or facility, there is the question, “is this a necessary burden or do you outsource this?” Being in a pool has its advantages, again in shared costs. Often companies opt to have additional support personnel at the host site, since we have heard that there can be problems with your (the customer’s) installation. These issues need to be addressed to avoid disruption in your operation and also need to be considered when you are thinking about the total cost of ownership. They are often glossed over during the comparisons that companies toss at you during the sales cycle. How the solution provider offers the technology makes a difference in their costs and thus may be reflected in the pricing for you. You can see these summarized in Figure 1. Unique custom codebase per customer—the cost of supporting each customer’s unique instances is higher for the vendor when they have many customers to host and support; therefore, cost of software to the user is similar between On Premise and individually hosted arrangements. The customer has an active role to play in accepting upgrades; therefore, additional costs are incurred by the user each time they upgrade. These costs are similar between On Premise and SaaS (if customer has their own unique instance) with all the requisite issues of change management, upgrading, and testing integrations. These issues lead to additional costs for the vendor as well, and will be reflected in either an annual support and maintenance contract or rolled-up into the ongoing payment schedule. Single instance code, on the other hand, has a ‘silent’ or quiet upgrade process going on all the time. Upgrades and functionality additions usually happen much more frequently than in the customer unique codebase model. All the costs for upgrading the software are shared across all the customers. And support for the provider is easier, since they don’t have to familiarize themselves with hundreds or thousands of customers’ unique installations. Therefore, single-instance environments may have no to low annual support costs. Hosting or On-Premise/License software can be hosted by third parties. The solution provider may host or refer you to a third party. If you go to the solution provider for this service, they may have cut a better deal with the hosting service provider—or not. But they will add their management fees to what the hosting service is charging them and include this in your ongoing support fees. Usually bundled in with SaaS delivery: process and technologies to provide high availability. This can include redundant servers and data storage in multiple, redundant data centers in different geographic regions; warm or hot failover between centers; hierarchical storage management; automated data backups; and redundant local network physical connections and service providers. Usually bundled in with SaaS delivery: datacenter employee training and protection of systems and confidential data against technical and socially engineered attacks including external attacks, denial of service, internal collusion, and attempts to access competitor’s data by other subscribers of the multi-tenant platform. Managed services such as implementing, running, and maintaining the system, data cleansing, data translation, system support, trading partner on-boarding, report generation, monitoring, etc. Outsourcing of the actual business processes—such as sourcing and buying, managing transportation, planning—on an ongoing basis. If you look at Figure 2, you can see a variety of costs associated with your purchase. Fundamentally, the types of costs don’t change. The real question is who manages them and how they translate into your service agreements, payments and contracts. The basis of pricing hasn’t varied much over the last 15 years or so, but now the software market is like the airlines—some charge for checked luggage, some do not; some charge for ‘more-room’ or ‘even-more-room’ seats. The services are the same; each provider looks at cost and the customers’ perception of value differently. Software can be offered as SaaS, on demand or leased. Payments can be divided based on frequency, basis, commitment period, or as one-time, upfront fees. Payments may be based on # of seats, # of transactions, # of sites, resource usage, or other basis. Some solution providers require a minimum commitment period of one to three years. Others may not require a commitment, but offer a discounted price for upfront payment of a year or more. SaaS providers typically have some sort of upfront fees, setup fees, and fees for on-boarding trading partners, data conversion, integration, configuration, etc. These may be a fixed amount or ‘time and materials’ implementation engagements. Vendors may offer a free trial period, special trial deals, or a free ‘lite’ version of their product. Hardware may be sold by the software or service provider. This can include site installations of wireless and wired communications devices, prefigured mobile devices with preloaded applications software, and so forth. Along with the option for a perpetual license, solution providers may offer leasing or renting of software and/or hardware and may provide hosting services. Annual maintenance fee. Can be a percentage of the license fee. What is included varies by provider. May or may not include all upgrades of your purchased software. Usage trial periods and policies for refunds vary. Software firms are reluctant to do pilots, but we recommend ‘try before you buy,’ since refunds are not common in the industry and are hard to obtain. Find out how solution providers charge for professional services, implementation, and training. Is it bundled into the license or SaaS fee, or separate? If separate, what is the basis, i.e. # of hours, # of systems to integrate, # of classes, # of trading partners? A few providers will offer pricing that is based on proven, metric-driven value delivered to the customer—such as monetary savings. This is rarely an all-or-none pricing, but rather applies to a portion of the cost. 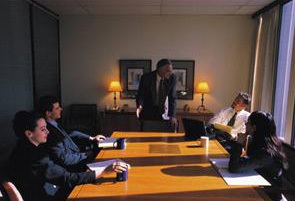 This approach typically comes with a risk-premium: The solution provider is taking a risk of not getting full payment, so if the customer actually does achieve the agreed-to value, then the cost of the solution will be higher than traditional pricing which is not dependent on meeting any performance criteria. When technology companies establish pricing, they are balancing several factors. They would like to charge in a way that scales up with the value received by their users—i.e. the more value you are getting, the more you should be willing to pay. They also need to make sure that the price covers their costs and desired profit. And finally, they at least should be trying to keep it simple and easy to understand (they don’t always succeed). For example, they may charge $1,000 per year per trading partner connection. This should align both with value received and the cost to provide. If you managed your own project with your trading partners and wrote your own code and managed it on an ongoing basis, it would cost you far more than that $1,000. Obviously it takes providers effort, time and money to build that connection, but they expect to recover their costs and then some by selling the same service hundreds of times, spreading the cost across their customers. First time users of these connections in Trade Financing, EDI, MFT, eProcurement, or Transportation Management often will pay a one-time set-up or on-boarding fee, but henceforth, on an annual basis, only the flat fee per connection. This allows the technology provider to recover the costs which are unique to each customer and also protects them if the customer fails to renew. There are companies, such as MercuryGate, that charge no set-up fees. One important consideration is that if you have hundreds of trading partners, these per-trading-partner fees can add up to a substantial annual fee. 3 But you should weigh that against doing your own programming and paying communications costs. For example, the solution provider has probably already built this connection, and can turn that on immediately, making you ‘trade ready’; whereas it would take weeks or months to do it yourself. This speed-to-implementation is an added benefit to you. They also will keep up with changes to compliance rules and standards for any of your trading partners, and make that information available to you as part of your annual fee. Often it is stated that a perpetual license is a benefit to users. This depends deeply on the functionality you seek. Once you buy the software, how often do the industry, rules, and your company change, requiring changes and upgrades to your software? If these things are not expected to change much, then a perpetual license may be useful. However, in a dynamic business environment this might not be as advantageous. Owning the software versus SaaS may be explained with a brief gym analogy: You can use the treadmill in the local gym as long as you are a member, but you don’t own the treadmill. Your monthly membership is cheap and the gym maintains the equipment. If you have a family and are paying family membership rates, you can avoid paying the higher monthly fees if you buy your own treadmill. Your whole family can use it any time of the day or night, so it looks like the better deal. Your single neighbor, though, likes trying all the new facilities and equipment a gym offers and has only his usage to consider. For him or her, then, the gym membership makes sense. It all comes down to individual needs. Software ages and gets out of date over time. So the issues are not just about the usage/meter, if you will, but the value of the asset over time. For example, what does it cost to maintain the software (upgrades and changes) over a five year timespan? Do you want to own the software anymore? This issue reminds me of auto leasing. During the lease your out-of-pocket expense is somewhat fixed, but may include a limitation on mileage. At the end of the lease you have an option to buy. You wind up paying about the same (give or take a few dollars), but the car is then yours. Of course, you have to decide if you still want to own it. There may have been changes in your life and you may want a new type of automobile. Kids gone to college—new smaller car. New kid in the family—bigger car. An example of this type of approach is Epicor’s SaaS offering. You make a five year commitment on the SaaS (license and fees divided by the five years) and at the end of that time you own the software. But, the same type of potential obsolescence applies to systems as to the leased auto. Solution Providers Are All over the Place! Subscriptions. Thought you understood these? SaaS, in the past, was a ‘metered out’ payment process over a time period. Some providers have a standard price for a fixed service. This is generally pretty straightforward, with tiered pricing: storage (100 GB for $x, 200 GB for $2x minus a discount); or seats, (10 seats for $500/seat, 20 seats for $400/seat), and so on. This type of pricing exists for many on-demand web offerings. But most of the enterprise solution providers we surveyed are not doing this. In fact, they are employing a cost plus model using the methods discussed earlier (each unique customer situation), then adding it up and dividing up by the commitment period. Often users have the option to pay monthly, quarterly or even annually. So list pricing may not exist in the true sense of the word. Each customer’s subscription will have a unique price. Alternatively, you can sometimes have your license fee (that you would have normally paid up front) paid on the installment plan just like a subscription. Not all companies provide all payment options. Confusing for both the sales people and customers, some of these firms do segment their customers by cloud/SaaS vs. On Premise to manage the deal-making and pricing. Pricing is closely guarded information, so we can’t reveal specific pricing. We can, however, provide guidance so that you can look at options and trade-offs and be armed with the information to ask the right questions and have an intelligent discussion. Continue reading Part Two where we discuss project costs as well as issues surrounding Total Cost of Ownership.